As the war on oily skin and wrinkles continues, beauty buffs are on the hunt for the next best “miracle” ingredient to help combat these pesky and sometimes unmanageable skin conditions. From peptides to alpha hydroxy acids, to some luxurious oil that’s been imported from the deep amazon with the “highest omega content of all time” (I’m being satirical here, but it’s kind of true! ), there is always an ingredient trending in this current $115 billion dollar industry. The consistent emergence of new ingredients is not such a bad thing, but what I’m seeing a lack of in the industry is education (and continuing education, at that) around ingredients that have existed for decades and that do work effectively when used properly, but are often not prescribed appropriately. In fact, some people “self-prescribe” their own facial treatment products and that, my skin care friends, can be a recipe for disaster. At Annmarie Skin Care the frequency of ingredient questions we receive is through the roof, and with one ingredient in particular: Retinol. Oh, retinol, how you’ve gained somewhat of a “bad” reputation in the world of skin care. Maybe it’s because of your misuse or overuse? Perhaps you are not suitable for certain skin types? Or maybe, just maybe, you aren’t being paired with the right skin care products in conjunction with your use. These are all possible and likely culprits. I’d like to dive into the history, functions and types of Retinol – then you can draw your own conclusion on this powerhouse ingredient and if it’s right for you. Retinol is simply pure Vitamin A, which is also commonly referred to as a retinoid. There are many natural and synthetic (prescription) forms of retinoids. We’ll discuss these different types further on. First and foremost, retinol has been around for decades and has been clinically tested with an abundance of successful results. This powerful antioxidant is all across the board with amazing benefits, but at what cost? It’s important to know the cons of topical retinoids before you consider using such a potent vitamin in your daily skin care routine. Retinol and retinoids are one in the same, but also different. To simplify the difference between the two, retinol can be purchased over the counter, while retinoids are prescription-only. Retinol is commonly labeled on over the counter products as retinol, but also under retinyl palmitate, retinaldehyde, and retinyl acetate, which are all derivatives of Vitamin A. OTC retinols are much weaker and work slower than prescription retinoids because the body first has to convert it into retinoic acid. This acid is the only active form that has a direct, biological effect on the skin (or “where the magic happens”). Retinoids, on the other hand, are prescription strength under the names retinoic acid or tretinoin. These are much more potent and work faster than OTC retinols because no conversion needs to be made by the body from retinol into retinoic acid—it is already formulated with retinoic acid. The classic brands Retin-A, Renova, Tazorac and Differin fall under this category. These differences inform us that retinoids have a much higher concentration of vitamin A, thus may be more effective for the skin. Prescription strength anything is far more active than over the counter products. In skin care, too active of an ingredient may sometimes not be to everyone’s advantage. OTC retinol and its derivatives still deliver amazing benefits to the skin (even though it may take longer to achieve them), without the potential side effects that prescription retinoids may cause. Often times a dermatologist might recommend these OTC forms of vitamin A for people with sensitive skin. All forms of Vitamin A break down and become unstable in the presence of exposed light and air, so it’s crucial to purchase retinol that is packaged in opaque containers or tubes, which is why they often come in metal tubes in prescription form. 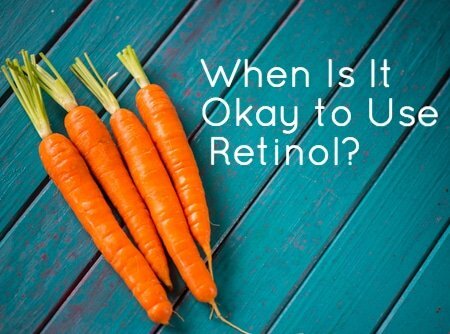 Do not apply retinol daily, but rather every other day. Gradual usage is key here so that your skin can acclimate to this active ingredient. If your skin is resilient and shows no signs of sensitivity, thereafter you may apply it once a day. Stop using retinol if irritation occurs with persistent use. The best time to apply retinol is at night because exposure to the sun can decrease its effectiveness. Use nourishing ingredients to help protect your skin while using this potent vitamin. Annmarie Skin Care products are wonderful to use in conjunction with retinol. Always wear sunscreen on a daily basis when using retinol. Skin irritation and side effects including: dryness, flakiness, thinning of the skin (if overused), sun sensitivity and redness. Filler ingredients such as: stearic acid, isopropyl myristate, polyoxyl 40 stearate, stearyl alcohol, and butylated hydroxytoluene are commonly used in retinoid creams and gels. Though not all ingredients prove toxic, do these align with your skin care philosophy? Cannot be used during pregnancy. Not suitable for sensitive skin, rosacea or eczema. At Annmarie Skin Care, it’s our philosophy to use the cleanest, most effective ingredients mother nature can provide. However, we do understand that the medical approach to skin care can be favored at times. We love providing as much information as we can around a particular ingredient, especially one that is known to deliver beautiful results (when used correctly). Fortunately, there are many options in the world of vitamin A! If you’re a skin purist like us, we prefer to choose natural forms of vitamin A in our skin care. Rosehip seed oil is an excellent source of trans-retinoic acid that may not have the risk of potential irritation that prescription retinoic acid might cause. We include rosehip seed oil in several of our products, like our Anti Aging Facial Oil. If you are looking to take a more targeted approach, you may use pure rosehip seed oil which can be purchased through one of our favorite herbal vendors here. Whether you decide to go with a pure vitamin A, prescription retinoid, or good ‘ol rosehip seed oil to receive the benefits of this fabulous anti-aging and oily skin assisting ingredient, we hope that this information has offered some guidance around your choices. Is Retinol Right For You? What has been your experience using retinol, retinoids or natural alternatives? Daily Mail – Is Retinol the Miracle Ingredient? Great article! I used prescription retinol and it had serious consequences for me. At first I thought this can’t be from using retinol, but ended up doing a huge amount of research … I knew it was possible, as I understand the delicate balance and interactions between the body’s cells etc…luckily I’m trained in research and microbiology. Firstly I had extreme nausea and it took me a while to work out the connection, I should have known, but owing to being so busy, I simply took my eye off the ball! So once I’d realised, but still being quite desperate to still see a difference with my skin, I then tried tiny amounts on the outer edges of my crows feet. I started to get horrendous eye pain and then recurrent eye infections…. I stopped the retinol completely at that point, but the eye problems continue to this day and cause a lot of problems in my life. I also developed shingles during all of this… I cannot say this was caused by retinol, but indirectly perhaps. It seemed to affect my body in a bad way and who knows if that weakness allowed a virus in, a virus that can just happen to hit during a low point? I don’t normally write reviews but I really feel that people should be aware how potent this can be and how it can affect the body as a whole. I did use a natural otc retinol previously with no ill effects. I wish I’d stayed with them! Maybe it was a necessary lesson, because it has made me question my vanity and what lengths I am prepared to go to. I am now only intent on using 100% natural products. Is the ANTI-AGING FACIAL OIL non-comodogenic? I think im allergic to retinol. Would that be possible ? I had good skin and decided to start retinol to prevent aging (im 25). I used peter thomas roth retinol fusion pm for 3 1/2 months and developed the worst cystic acne ive even seen. I now have pimples all over my cheeks and chin (eeeeeverywhere). Its all red and swollen, you cant see skin underneath. I stopped using the profuct 2 weeks ago and my skin has calmed quite a lot. But i started using roseuip seed oil and cystic acne seems to reach the surface again, tho not as intensely as with the retinol i was using. Could i be litteraly allergic to trans retinoic acid? Do you suggest i stop rosehip seed oil too? I dont know if there is such a thing as being allergic to trans retinoic acid. I have been wanting to add carrot seed essential oil to a homemade sunscreen recipe, but somebody mentioned that vitamin A is found in carotene in the oil, and can be harmful if used topically. Though highly concentrated, would adding 20 drops to about a cup or two of sunscreen, make a huge difference? You can still add that retinol also has a skin lightening effect. I love your suggestion of rosehip seed oil as a natural alternative to retinol. I have been prescribed a topical prescription retinoid in the past (tretinoin cream) and have had unpleasant results–redness, flakiness, and an almost burning sensation to my skin. I suffer from acne and have oily yet dry, sensitive skin (it is been a long-term problem for me, one which I have struggled to find products that help control my acne and oil yet are still moisturizing). I visited Mountain Rose Herbs to see about purchasing rosehip seed oil and noticed that under the Precautions section, they state that this oil is not recommended for use on acne or on very oily skin. What are your thoughts and/or suggestions? Thank you so much for the interesting and informative articles you provide! Hi. thank you for this article. I’ve used tretinoin in the past and have recently been prescribed some also. I’ve researched and read a lot of good things about it and some not so good. I’ve kind of been torn on whether I should use it or not and if there would be any negative side effects long term. (Years) I really had a sigh of relief reading this post from you guys because I do try to be health conscious of what I’m putting on my skin. I use organic rose hip oil but didn’t know that was a derivative of vitamin A.
I was wondering if you had specifics on tretinoin thinning the skin and over usage. Does this refer to the amount used when applying it or over periods of time? Is using it every night too much? Is it clear what is too much? And if it does cause your skin to thin is that permanent or reversible? Thank you for the article and your time! I had ask you the question about Retinol at the end of one of the surveys you sent me. About 5 minutes after asking that question I found your excellent article on that very topic. What I appreciated most your article was how you presented the facts about Retinol and information on both OTC strength and Rx strength Retinol. I appreciate the research you presented and your unbiased in allowing me to make an educated choice. Thank you very much for your integrity in allowing me to form a choice. I can make informed choices when I am presented unbiased facts. Thank you! I used a prescription retinol and my skin immediately started peeling. I use a retinoid for my eye cream at night and this has not irritated my skin like the prescription did.